You are currently browsing the tag archive for the ‘workshop’ tag. Go on, admit it. How many times have you wondered what’s wrong with that painting? It may be a technical problem or a place where all of your colors turn to mud. Or maybe you just can’t put your finger on it and need another opinion. 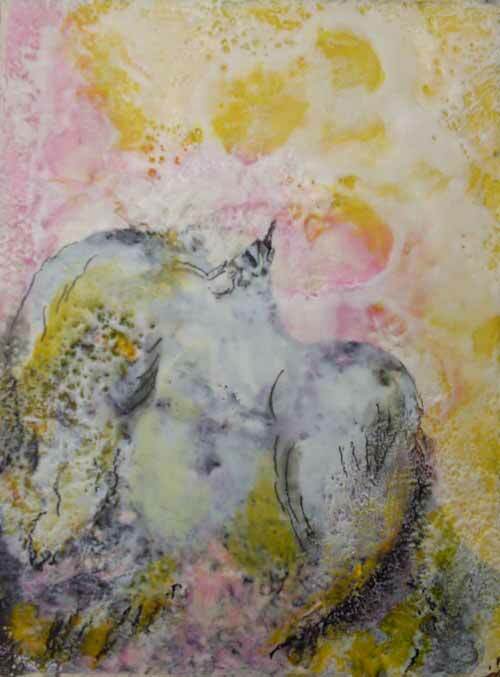 In this class each artist will share one of their problem paintings with the class and we’ll discuss options for fixing it, then you’ll have the rest of the class to do just that, with help readily available of course! Here’s how it works: You choose 1 or 2 of your problem paintings and bring them to class. We’ll work as a group to help you discover how to improve you work or discuss how to solve any technical issues. With this collaborative approach we can all learn from each others challenges. No class will ever be the same because what we cover depends on who is attending and what questions arise. This class is not intended to teach you new techniques, but rather to help you perfect those you have tried but are having trouble with. In addition to your questions, you’ll benefit from the help the other students need as well. I hope you’ll join me for a low pressure way to learn from your (and everyone else’s) mistakes! Tuesday, Oct. 21. All levels welcome. Saturday, Oct. 25. Intermediate level class. Saturday, Nov. 1 or Dec. 6. All levels welcome. Saturday, Nov. 8, Intermediate level class. Saturday, Nov. 15. All levels welcome. Saturday, Jan. 10, All levels welcome. View class photos, descriptions and register at the link below. 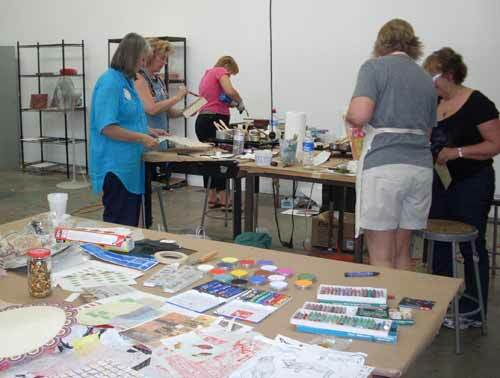 For most classes all supplies are included and no experience is necessary. 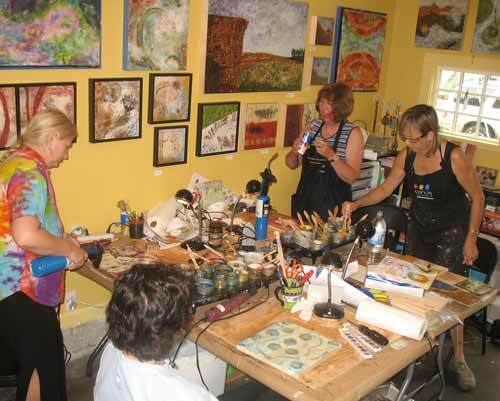 These classes will be held in my private studio in Portland, Oregon. Everything is so orderly before we get started, then creativity causes beautiful chaos. “So that happened.” That’s one of my favorite quotes from a great little movie called State and Main (yes, they use the line in the trailer) and seems to sum up my recent teaching experiences in California and Tennessee. I hadn’t planned to teach two weeks of classes in different states back to back, but that’s how it worked out and I have to admit some of it is a blur as I look back. What is crystal clear are my memories of the talented and incredibly creative students I worked with and the beautiful work they made. 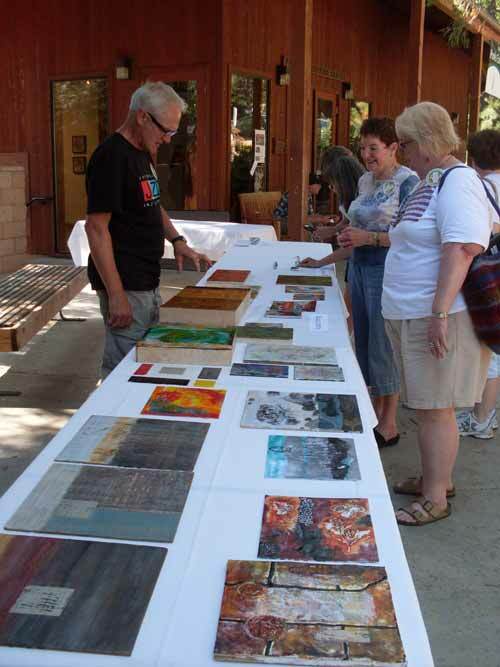 I’ll start with Idyllwild Arts in California since that’s where my journey began. If you haven’t been there it’s well worth the trip to spend some time in such an amazing setting surrounded by caring teachers and staff. It’s a stunning area with a winding drive from hot and dusty Palm Springs up to the 5,000 foot mark at Idyllwild, where the weather is much more hospitable. I made the mistake of arriving after dark so I missed the drive up but that made for a nice surprise on the way out. Below are some photos from my travels. Enjoy! 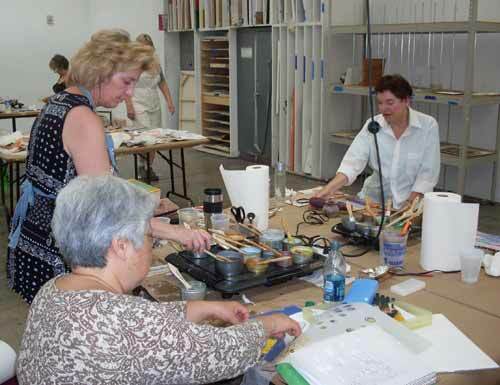 We had an excellent studio for the class, and everyone got right to work. We had an interesting collaboration, where Vicky started this piece (left) and Rosemary finished it (right). This is a great exercise if you get stuck. Many students brought materials to donate to the collage table so we had lots of fun images to choose from. 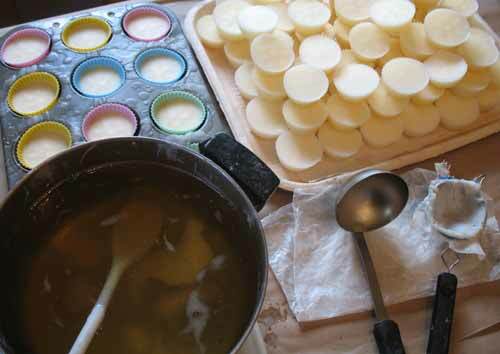 It was warm enough to set up a prep station outside for those who wanted to try textured gesso. 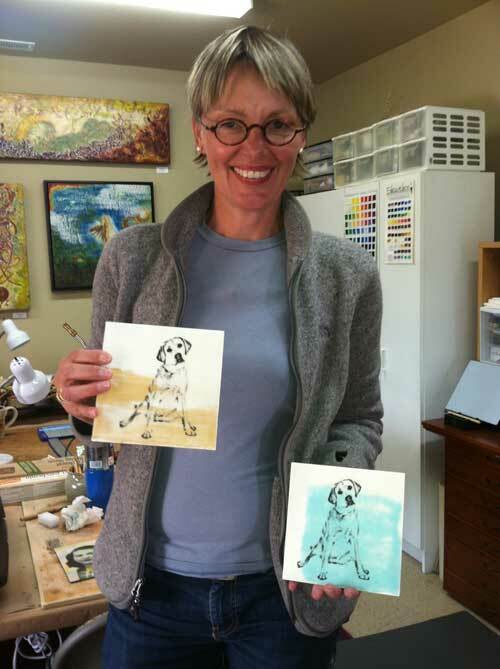 Anne tried an image transfer that didn't work out, but it ended up looking like a bird silhouette so she took the work in a great new direction! 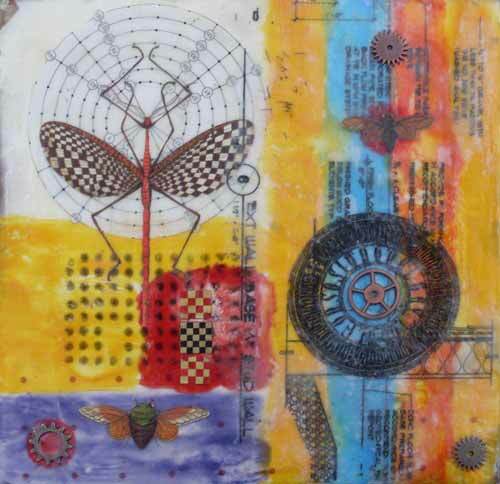 When I have friends nearby I often invite them to visit so students can see more original encaustic work than I can fly with. Amber George was kind enough to stop by to talk about her work. To see more of her work click this photo to visit her web site or go to http://www.ambergeorge.com. Everyone hard at work on the last day of class. 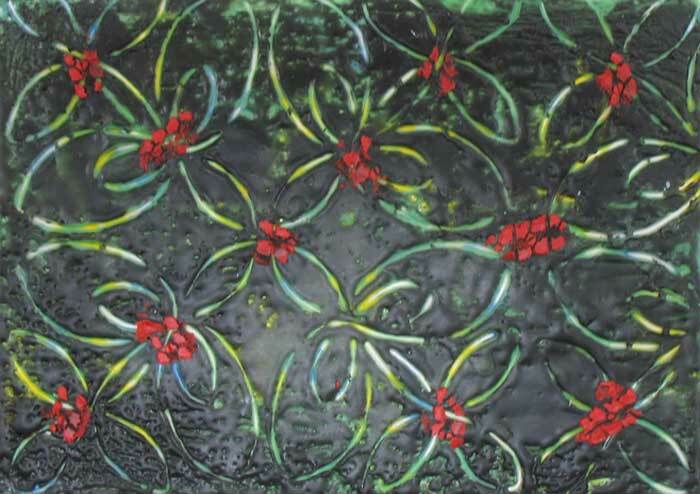 Sharon had been working in a very distinctive style in other media for years and was able to apply her design background very nicely to her work in wax. At the end of each week long course there's a show of everyone's work. Here's Roger discussing his latest work. Here's our class photo. Thanks to all of you for a wonderful time and many creative memories. I hope to see you again soon! I’ll be teaching outside of Oregon so much this summer that I have time to invite a couple of guest artists to teach in my studio. 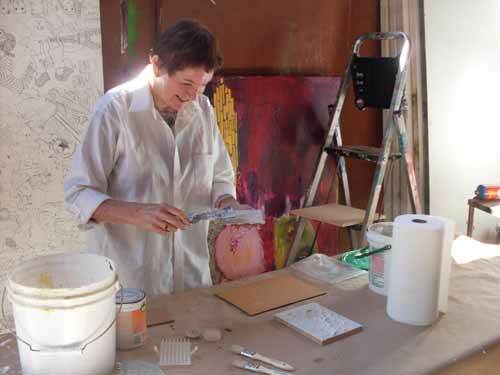 The first I’ll introduce you to is my friend Kimberly Kent, who has been working in encaustic for many years and is an expert with color. If you’ve taken one of my classes you probably heard my joke that Kimberly could mix plaid! OK, I didn’t say it was a good joke, but it’s true. 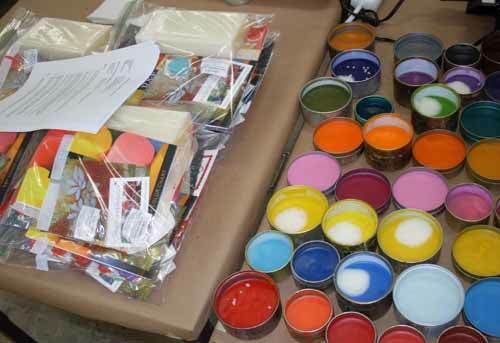 In this excellent companion to my Making Your Own Paint class, Kimberly will help you expand your encaustic palette while you develop your color sensibility. 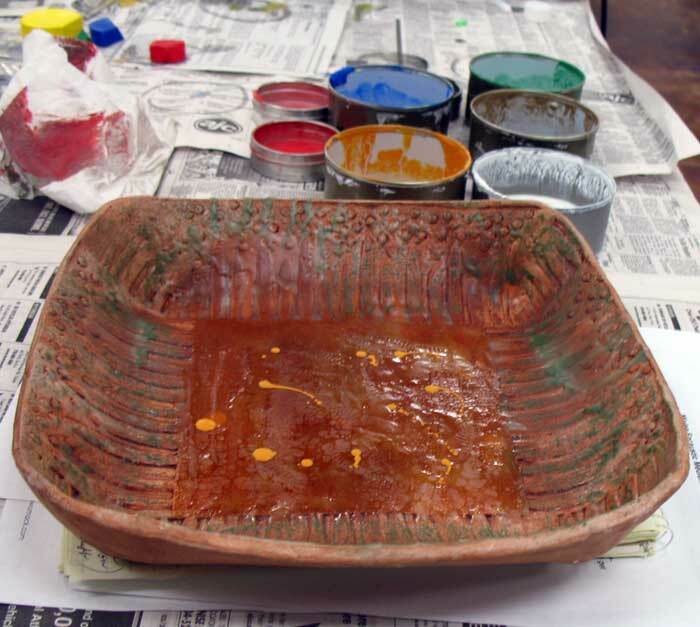 Learn to mix, glaze and see color better. The exercises and techniques in this class will give you new tools for understanding how to mix just the color you need. Each student will mix a full range of colors from basic colors and leave class with a traditional color wheel and charts to use for future reference. 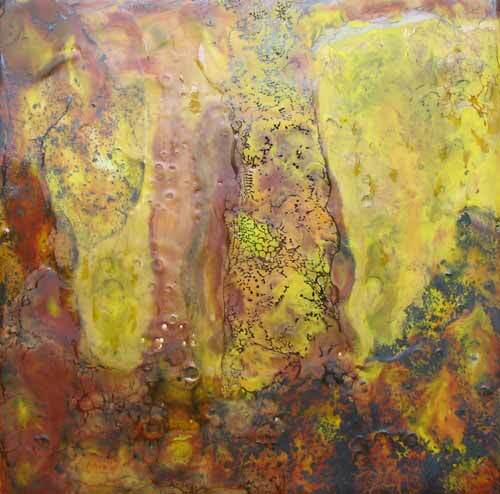 The class will be taught in encaustic, with a set of basic mixing colors. All supplies and tools will be provided. The term en plein air comes from the French, “in the open air” and that’s just how you’ll paint in this class using a camping stove to heat your paint and a torch for fusing. 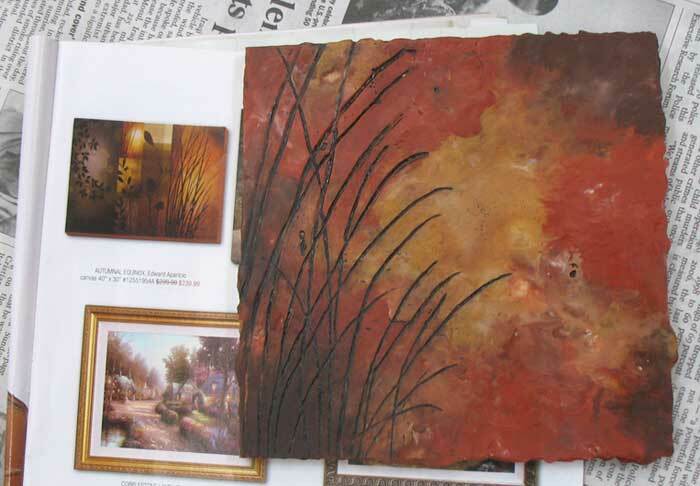 The technique refers to landscape painting completed on site, in a natural setting. 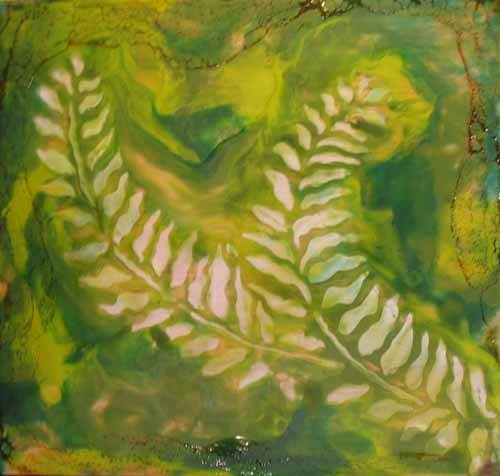 With the right tools and techniques you can paint in encaustic in the field. A plein air painting concentrates details on colors and the play of light and shadow. You’ll begin with large shapes and blocks of color tones while keeping in mind the lights and shadows. 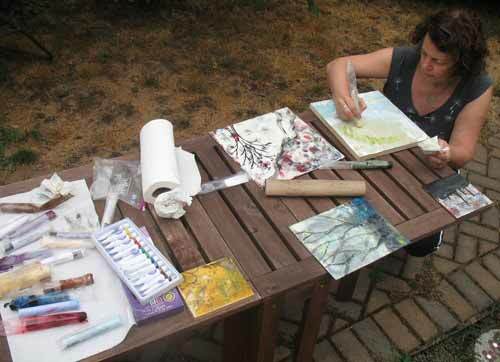 Most plein air artists start in this way and quickly lay out the entire painting. 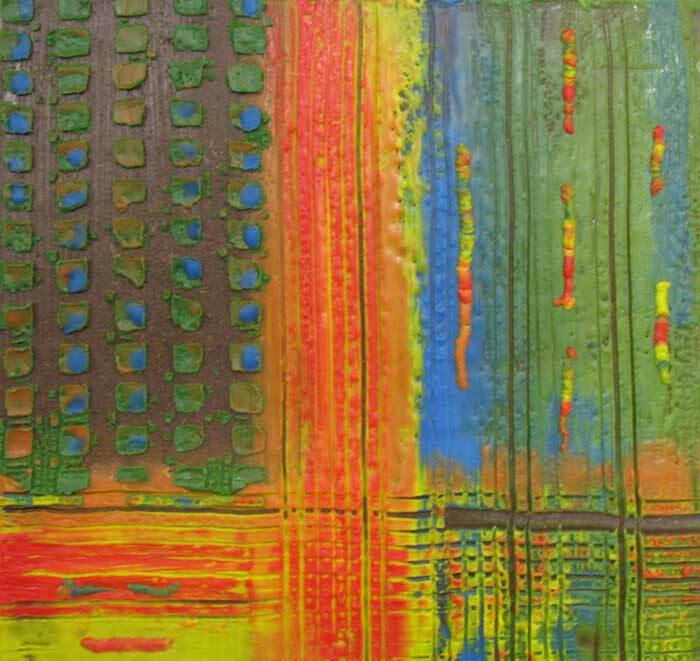 At first it may look like an abstract work, but slowly you’ll add detail to your painting until you have captured the essence of the scene before you. Treat yourself to this new way of seeing your world. 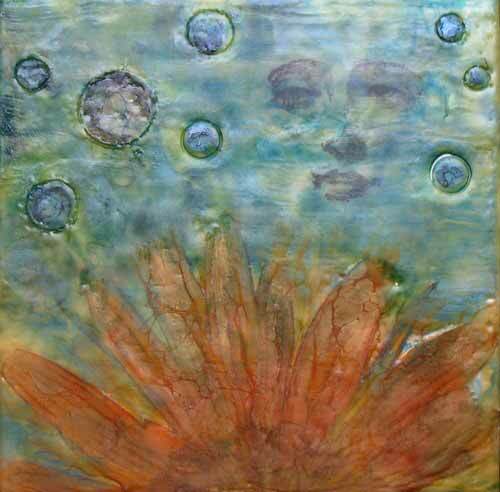 This class is designed as the next step in expanding your use of color in encaustic. 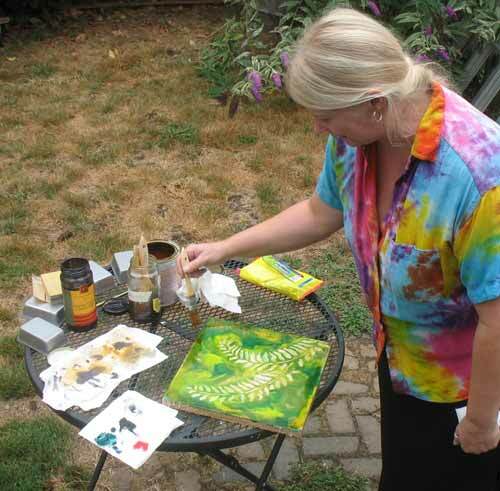 Kimberly will have you start with some basic exercises to help you see your colors as values, exploring the use of shadows, darkness, contrasts and light. Using simple compositions you will put this knowledge to work. 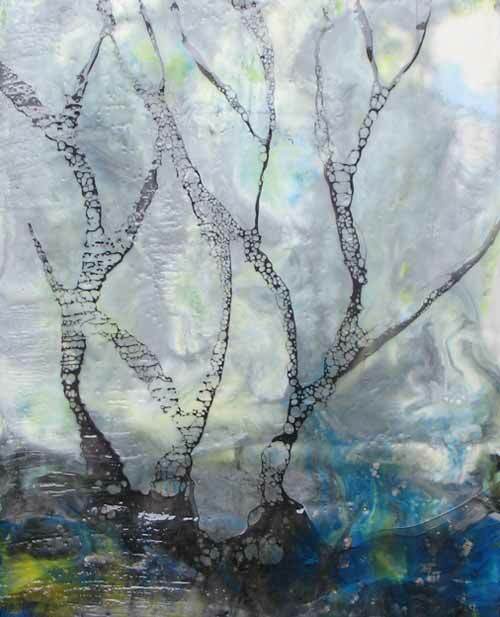 She will borrow techniques from other art forms and adapt them to work with encaustic. Composition, value, and color theory techniques will help you bring your work to the next level. Veiling with layers of translucent color can produce amazing results. 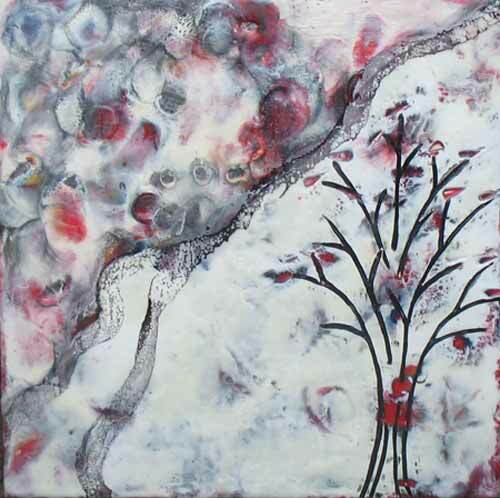 You will play with veiling and layering to create depth, distance and interest in our paintings. All supplies and tools will be provided. I hope to see some of you in these new classes! 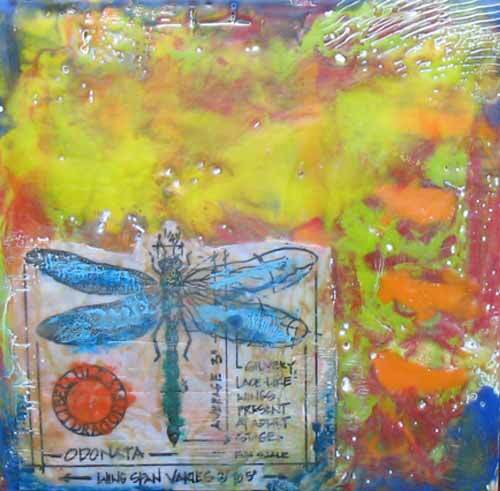 as always, you can see my full schedule of classes within Oregon and around the US and Canada this summer on the Embracing Encaustic web site. As the temperature hit an unheard of 102 degrees in Portland last week I had a decision to make. 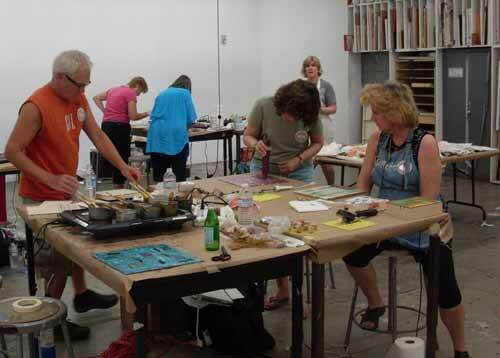 I was facing a three day workshop that had been sold out for months in a studio where at least 3 griddles and various tools would be contributing 200 degrees or more for each of the six hours a day we’d be in there. I snapped. It was time to buy an air conditioner! 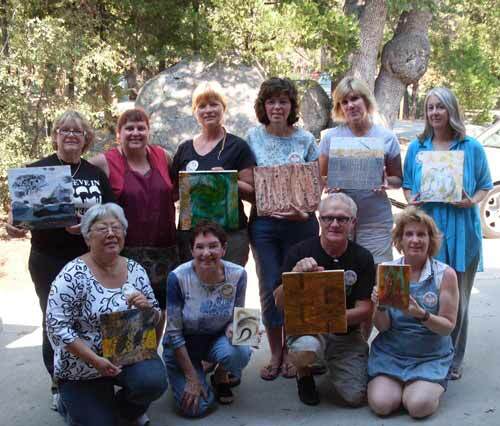 This was a very unusual 3 day class offered because I had three out of town visitors who wanted to attend my full range of classes — from beginner to intermediate to advanced — all in a short visit. 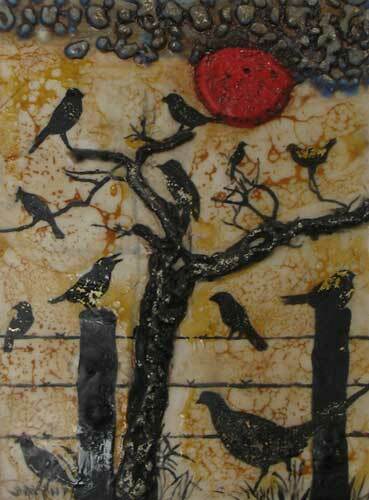 There were 3 classes covered: Beginning Encaustic Intensive, Beyond Basics (my intermediate class) and Advanced Encaustic Techniques. I welcomed Thea and Sylvie from Canada (in black aprons) and Suzanne from Sacramento. 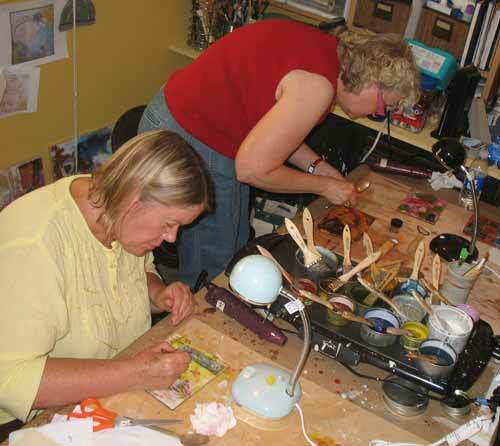 Also pictured is Brenda (sitting) who lives in town and has taken many classes from me. Everyone created so much work over the three days that we eventually moved to additional tables outside to make a ‘safe zone” for finished work. Even that area was eventually taken over when we decided to spread out and use oil sticks and oil paints outside as the temperature finally cooled to an agreeable 76 degrees on Monday. Everyone left exhausted but happy and I took a very long nap. What fun! Thank goodness I had an Encaustic Painting Intensive workshop today because it meant that I needed to get completely unpacked from my trip to the folk school in North Carolina. I had been working on it all week but there’s nothing like a hard deadline to get things done! There are so many images to publish I don’t know where to start. I think I’ll just put some of the most interesting ones online and let them speak for themselves. Enjoy! A couple of students were trying their skills at copying art work from a catalog with beautiful results. Linda’s work is first then Brenda’s. That’s it for now, I have to get to class. More soon! 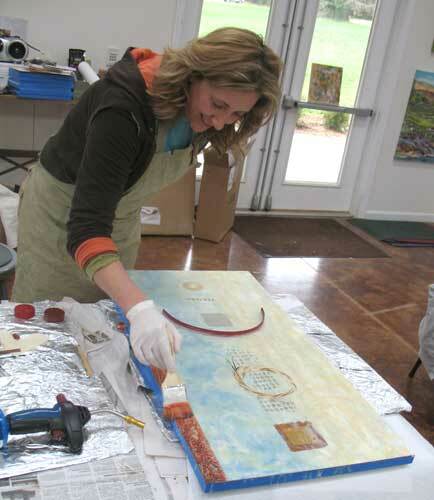 A North Carolina treasure for more than 80 years, the John C. Folk School offers workshops in art, craft, dance, music, cooking, storytelling and writing. 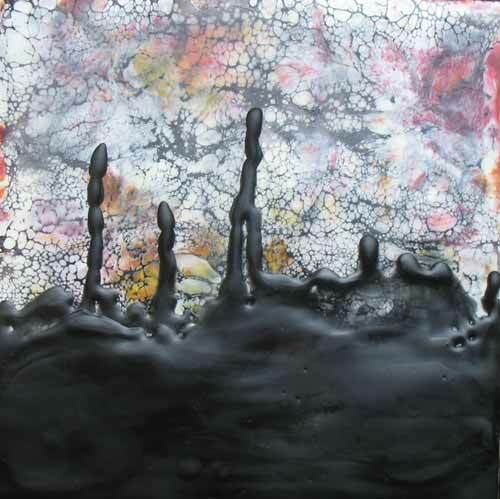 I’m teaching a week long workshop here this week called Incredible Encaustics, which combines beginning and advanced classes for a complete introduction to encaustic painting. 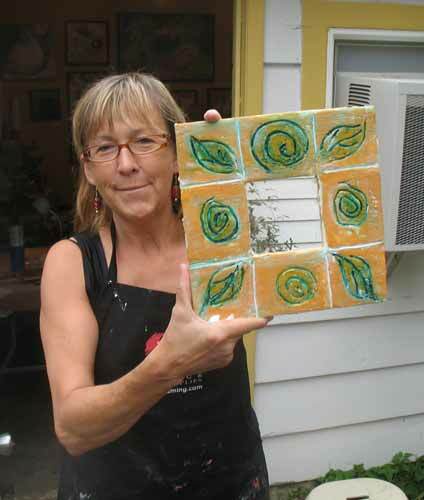 This will be my first time teaching at the folk school and I am honored to have been invited. I’ve been preparing for the trip all week, making encuastic medium for my students and trying to figure out how to get all of my equipment across the country in two bags that weigh no more than 50 lbs. each. This was not easy, but I made it! And the TSA didn’t even remove anything from my bags. Imagine finding damar resin crystals and bars of wax in someone’s luggage without knowing what they were…I put copies of my book in each bag just in case. Tonight I met my new friends for the week and I showed a quick slide show to give them an overview of the general technique and the amazing variety of looks you can get using wax. Everyone seems very excited! I’ll try to post a couple of times this week if I am able, otherwise you’ll get a nice long post when I return. 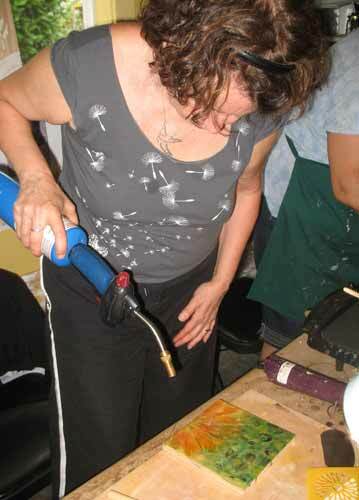 I debuted my new class tonight, Mixing Your Own Encaustic Paint, and everyone went home energized and ready to make more! First we mixed up a big batch of encaustic medium (beeswax + damar resin) then used that mixture to make paint using each students choice of pigment and colors. 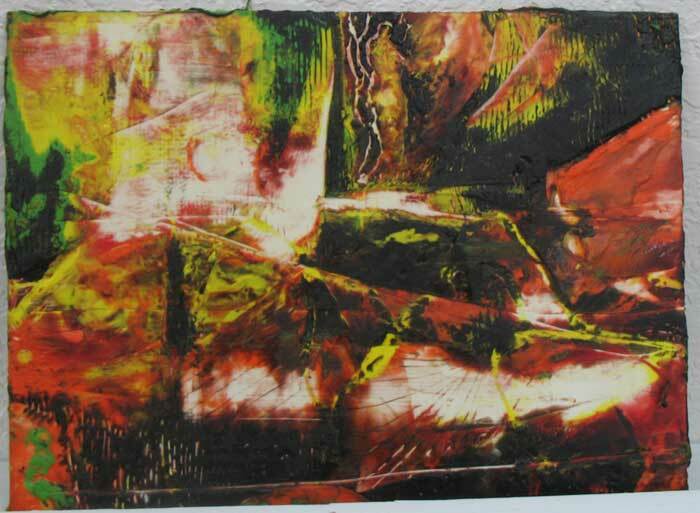 Powdered pigments were popular, as were Lyra encaustic crayons. 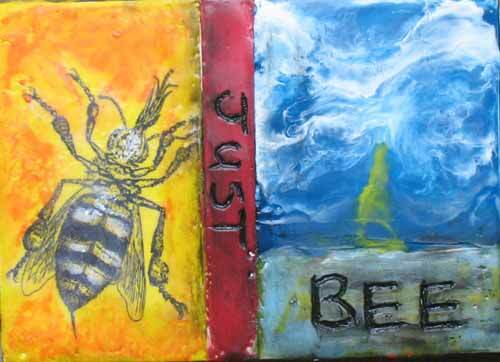 Here I am demonstrating how to mix encaustic medium using beeswax and resin. We later used what was made here to mix our paint. 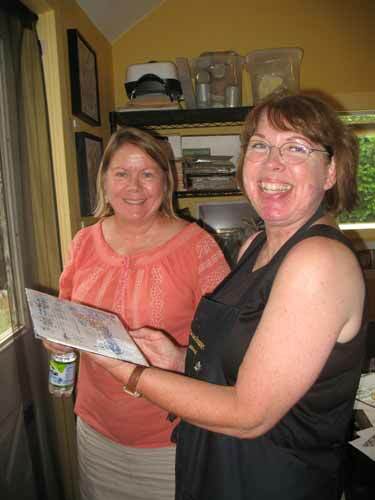 Ruth and Cinnamon remove their new paint from the griddle to cool. Everyone takes home 4 pots of paint. We also discussed the unique properties of pre-mixed paint brands including R&F Handmade Paints, Evans Encaustics, Enkaustikos and Wagner Encaustics. Before the night was over everyone got a chance to try mixing paint directly on the palette, and learned how to clean up waxy brushes. After learning to mix the medium and paint themselves, each student wet home with 3 colors of paint and a pot of clear medium. 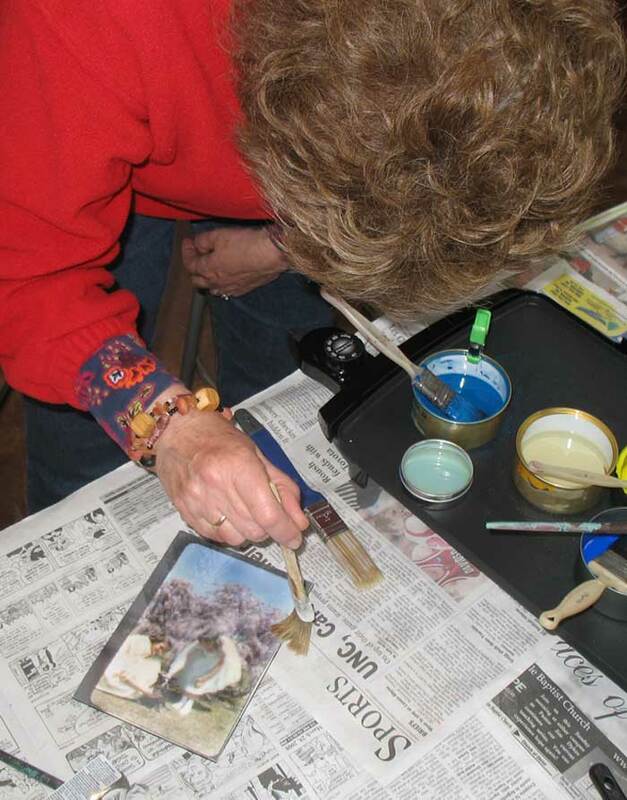 If you want to try it yourself join me for the next paint mixing class on April 24. Start saving your tuna and cat food cans now! See more class images here or visit my web site for upcoming class schedules.